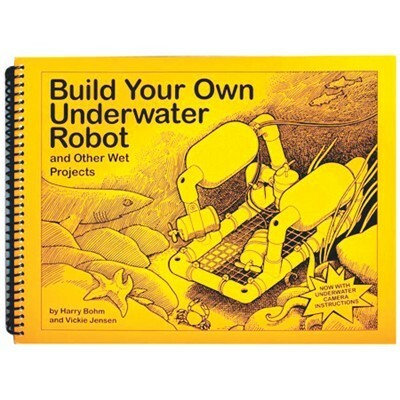 Produktinformationen "Build your own Underwater Robot (7th Printing)"
BUILD YOUR OWN UNDERWATER ROBOT introduces the excitement and technology of underwater exploration. It presents clear, well-illustrated projects—from underwater robots (ROVs) and gliders to diving bells and model habitats. All are constructed using inexpensive materials available at local hardware, hobby and electronics stores or via the internet. This is the book that launched a thousand ROVs--and started the “underwater robots in the classroom” revolution! BUILD YOUR OWN UNDERWATER ROBOT helped the Marine Advanced Technology Education (MATE) Center dive into ROV education in 1999 and inspired the creation of MATE’s International ROV Competition, now in its 12th year! It also served as the backbone for MATE’s UNDERWATER ROBOTICS: Science, Design and Fabrication, which contains more advanced coverage of these topics. This amazing book also inspired the SeaPerch Remotely Operated Vehicle (ROV) educational program, set up in 2003 by the Massachusetts Institute of Technology Sea Grant (MITSG) College Program. Sponsored by the U.S. Office of Naval Research (ONR), the SeaPerch Program equips teachers and students with an ROV kit and curriculum for fun, hands-on learning of STEM skills. Weiterführende Links zu "Build your own Underwater Robot (7th Printing)"
Weitere Info "Build your own Underwater Robot (7th Printing)"
Kundenbewertungen für "Build your own Underwater Robot (7th Printing)"